Too KEWL Suzetta!!!!!!! I'm gonna try this one of these days! Thanks for sharing! I have never heard of this technique. It is such a unique and interesting idea that I might actually break my rule of not buying any more yarn until more of my stash has been used. On the other hand, I might just try using two or more strands of worsted wt. together and see what happens. Fellow ScarfCrazy member here. I like this pattern too! I tried it with 2 worsted strands and didn't quite get the long drop between rows effect. So darn it all, its off to the store to get some nice bulky stuff on sale. I'm pretty sure I'm doing it right. Basically knitting off the small to the large and vice versa right? Do I knit loosely or tightly when I go to the 11's? I think that's where my hitch is coming from. I've already got another pattern for the worsted that didn't work for this pattern. So either way, I've got a few scarves headed toward Red Scarf project. BTW, if you havent already done this one, consider yourself TAGGED. See my blog for details!!! Finally worked through everything and made a gorgous homespun in shades of red. I made it extra long too for either a taller person or a few extra wraps around the neck. Now if I can only get the camera to work right. What a great pattern! Can't wait to try it and I think I'm going to use this pattern for the Red Scarf Project. Thanks for sharing the pattern! Thanks for the pattern Suaetta.. It was lots of Fun !!! I spent the weekend making up these scarves, using a variety of yarns with a variety of needles. I have at least 5 left, after everyone in the family claimed the one they say I made for them--so these lowly 5--and any more I make--will be off to the red scarf project by the end of next week. I loved this pattern and how it worked up. 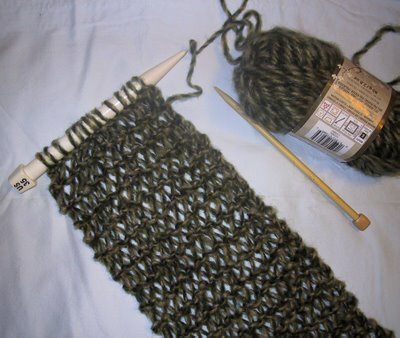 I did this scarf as a last minute one and liked it a lot, did a sweater using this technique many years ago and it is still around. How cool, I've never seen a needle like that. Hi! I recognize this technique...we used to call it "Broomstick Lace" ... guess that really dates me!! Actually broomstick lace is a different technique. I did quite a bit of that in the 70s. It is done with the large needle and a crochet hook. I normally don't post but when I read kami's comment I had to as my grandma would knit every day and frequently used this technique, and she was always a big supporter of the 4-H. Thanks for reminding me. Oh my goodness, I still have my Condo Knitting needle set still in its original pouch that I bought way back when. It was packaged by Susan Bates Quicksilver Silkon Finish and the price was $7.95. The needle sizes were 2 size 7 and 1 size 15.it also had a rubber gripper to untighten the needles and a metal tightening pin. I thought that condo you have mentioned is a property. Will gonna try it, thanks for this post. i love knitting, but at first i thought your post is about knitting scarf for a condo unit.. Well, very nice technique. And the patter is cool.